I will admit that the thought of teaching toddlers thankfulness seems like a daunting task. Thankfulness appears to be a rather abstract concept that most toddlers would not be able to grasp unless they are given a tangible way to learn. So I started to brainstorm ways that I could teach Little Bee how to be thankful. A laminated picture "Thankful Book" was the idea that popped into my head. Little Bee loves to look at pictures of his beloved family members and since all his grandparents live in another state, I wanted to make him a little picture book for him to carry around to look at. Obviously he can not read yet, but I wrote words on one side to match the photo on the other side, for ways that I feel Little Bee is thankful regarding that special person. Every evening Little Bee enjoys sitting on my lap to listen to a good story. I plan to read this little thankful book to him and together we can point out the special family members that we love. Instructions for Crafting Your Own "Thankful Book"
To create the Thankful Book, I printed our favorite 4x6 photographs at a local print shop. I recommend using all vertical photos for this project. I mounted the photographs onto colored cardstock, using photo splits which are double-sided adhesive squares made specifically for photos. You can see in the picture above an example of a booklet of tear-out pages of colored cardstock, where each page measures a little bigger than a 4x6 photograph. You can also use regular letter sized cardstock, it will just require some extra measuring and cutting. I like using the photo splits because when the photo is laminated onto the cardstock, there isn't any visible lump, while regular glue or tape folded onto itself will appear as lumpy. After mounting the photos onto the cardstock, I matched up the photo with the back of another photo and wrote my thankful sentence with a magic marker. After that I placed two 4x6 sets into one regular letter sized laminate pocket. I carefully ran the laminate pocket through my Purple Cow laminator that I bought from Costco. 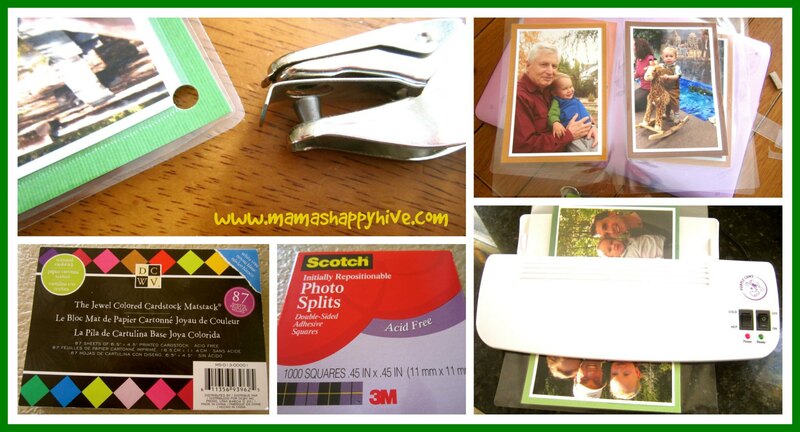 The pockets laminated beautifully and then I cut out each photo and punched a hole in the corner. I put all the photo sets in order and connected by booklet with a metal ring. Pictured here are several examples of what the inside of our Thankful Book looks like. 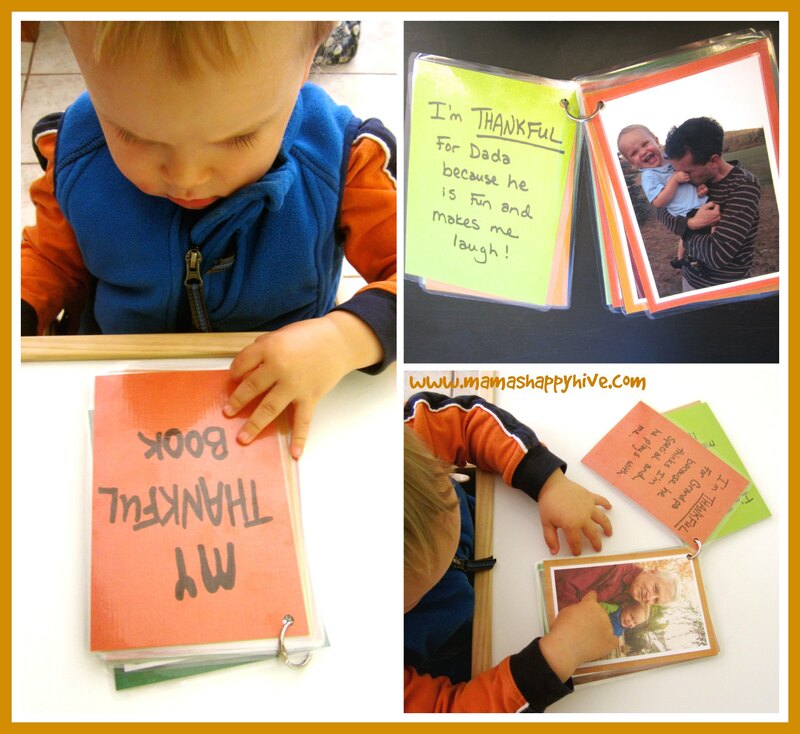 I love how sturdy and durable this little Thankful Book is for all those toddler explorations. It can be carried around the house and even wiped clean from toddler goo. These thick laminated pages may even handle a bit of mouthing and chewing. It's a wonderful little book to throw in the diaper bag and bring along for a car ride or for quiet time at church. I hope you enjoy your Thankful Book as much as we do, and if you do make one... please share your crafted book with us! We would love to see how it turns out. 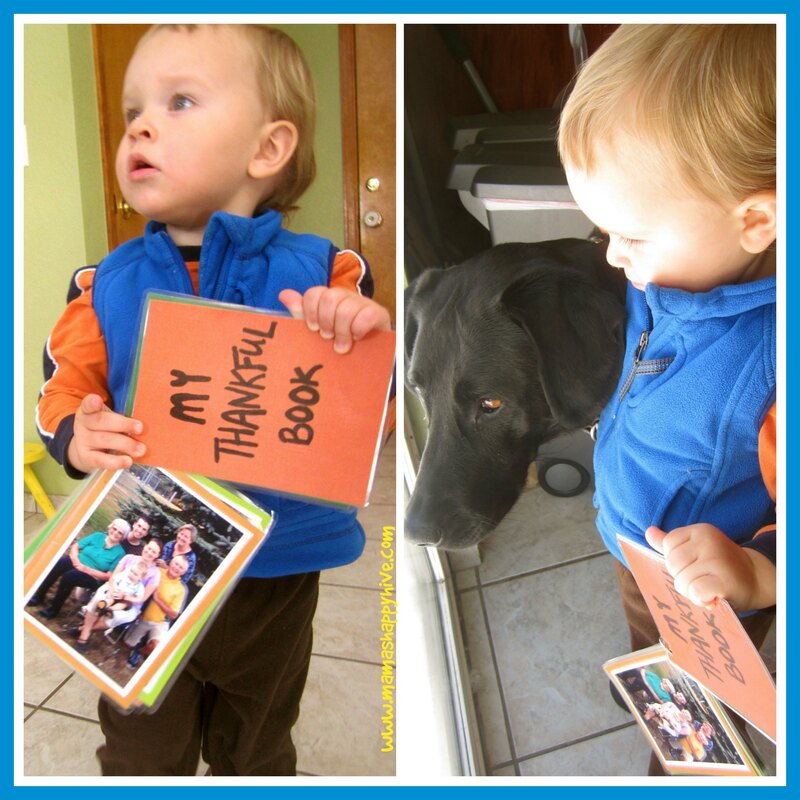 If you loved our Thankful Book, please share it and PIN it! Beautiful idea! Kids love looking at pictures of themselves and people they know and love! Thank you so much for your kind comment. I agree, children like to learn by identifying others with themselves. I love this Thankful Book! The Thankful book is amazing. What a great idea to teach an abstract concept. This is a really great idea! I think i’m going to do this for my girls! Wonderful! I hope they LOVE it! I love this fun idea! Thank you so much for stopping by the Learn & Play link up! Your post is featured this week on Christian Montessori Network.